SugarSync is an efficient cloud storage utility that allows you to back up your important documents with great ease. The file transfer application helps you synchronize and share your personal data across all remote computers or other devices. In order to work with this online storage program, you need to set up your SugarSync account with an email address and a password. After creating your account, you can easily access your confidential data from any Windows machine with Internet access. The utility works in the background and syncs your files and folders whenever you make any change. For uploading any document to your account, you can simply use the “Select” icon present at the lower edge of the screen and browse through your system for the document that you need. After this, you can load it via “Add” icon. The online backup service lets you upload several file types, including music, video, and .exe files. On top of that, SugarSync for Windows has a tabbed interface, allowing you to switch between its numerous functions, specifically “Cloud”, “Sharing” and “Activity”. In addition, the software offers various menus for easy access when trying to sync or share a specific directory. The application provides you up to 5GB of free online storage during the trial period, after that, you can upgrade to some more GBs either for a monthly or annual fee. 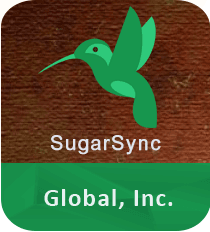 The latest version of SugarSync gives industry-standard secure (SSL 3.3) transport layer security data encryption and handshake protocols during both uploads as well as downloads over the Internet for your security. Download SugarSync to start storing and sharing your content online with your friends. > Initial backup may take a while, depending upon the combined size of your files. After that, the app automatically backs up data that you work on. SugarSync is an easy-to-use tool that gives you a number of options and features you’re going to need to backup your content and restore them. The Windows program is designed to help you securely transfer and store your personal data, as well as share the files that are stored in the cloud. As soon as you sync the content with your cloud account, you can access the uploaded document from any location as all you required is an Internet connection. Overall, SugarSync is the perfect solution if you’re looking to backup your data online and be able to access it on the go.